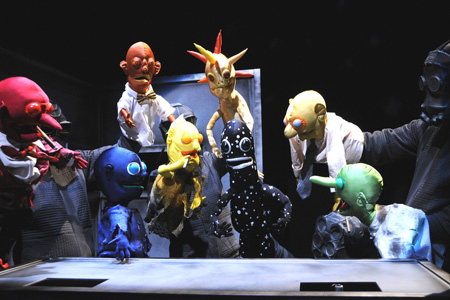 Wabash College’s Visiting Artists Series will present Wakka Wakka Productions: Baby Universe (A Puppet Odyssey) at 8 p.m., Thursday, November 7, in Ball Theater in the Fine Arts Center. Baby Universe is an original piece by the New York City-based troupe Wakka Wakka about a futuristic government program to save the population of a dying planet in a dying universe. In a race against the clock, scientist-generated baby universes are placed in the care of lonely spinsters in the hope that one might nurture a savior universe capable of birthing a planet that can support the populace of an entire world. Wakka Wakka has created and produced six original works of theatre, previously performing, FABRIK: The Legend of M. Rabinowitz in 2009 at Wabash. The troupe creates innovative visual theatre in a wide range of styles, incorporating elements such as object movement, puppetry, and masks. Photo: Baby Universe presented by Wakka Wakka Productions; Photo by Jim Baldassare.